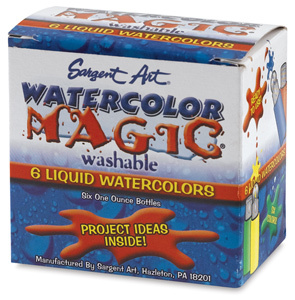 Sargent Art Watercolor Magic is bold, brilliant, American-made, and AP certified non-toxic. It's great for almost any watercolor painting or paper craft project, including rubber stamping. In liquid form, it really goes the distance and can be diluted with more water to go even further. One bottle can last up 100 times longer than a watercolor cake, making it a very economical choice for the classroom. Like magic, this watercolor washes from most fabrics and surfaces with simple soap and water. 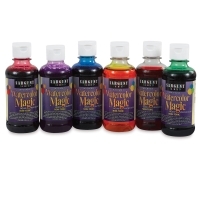 Glitter Set of 6 — Bold, brilliant, and full of sparkle, this set contains six 8 oz bottles of Black, Blue, Green, Red, Violet and Yellow. 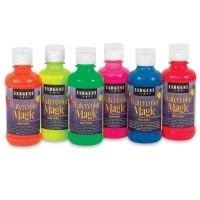 Fluorescent Set of 6 — Sure to add eye-catching color to any project, this set contains one 8 oz bottle each of Blue, Chartreuse, Green, Pink, Red, and Yellow-Orange. Set of 6 — This set contains 1 oz (30 ml) bottles of Yellow, Red, Violet, Green, Blue, and Black. 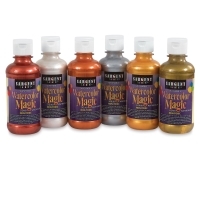 Metallic Set of 6 — This set contains 8 oz bottles of Pirate Gold, Pearl White, Antique Gold, Gold, Silver, and Copper. 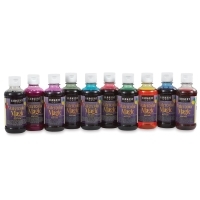 Standard Set of 10, 8 oz Bottles — This set contains 8 oz bottles of Yellow, Orange, Red, Magenta, Violet, Blue, Turquoise, Green, Brown, and Black. 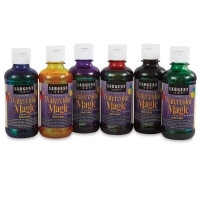 Standard Set of 6, 8 oz Bottles — This set contains six 8 oz bottles of Yellow, Orange, Red, Violet, Blue, and Green.